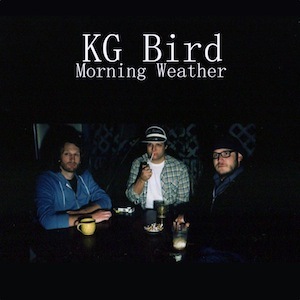 On their debut EP Morning Weather, Los Angeles-based KG Bird nods towards classic vintage sounds while binding it together with their spin on modern folk-rock that is just in time for the approaching summer. Simply put, it’s a fun effort. But what sets KG Bird apart from the rest of the pretentious guitar-twang bands is their old-school charm that’s transparent in each song. Led by siblings Tim (guitar) and Chris James (guitar/vocals), KG Bird opens with “Pull The Mask Off.” It’s simple in structure, but grabs your attention with infectious guitar hooks and steady beat. The vocals also have a certain inflection to them that gives it a warm rockabilly tone. “Suffer Tiny Whales” slows down the pace with its bluesy chord progressions that builds towards a frenetic swirl near the five minute mark. Closing out the EP is the trio of “Morning Weather,” “I’m a Child,” and “Parlor,” which evoke the folk melody style of the ’60s/’70s akin to The Zombies with a dash of Ziggy Stardust-era Bowie.